Where are the oldies in Australia? I've never seen one in the flesh , but Tassy is a small state. This section of the forum is dead quiet so I was wondering , are there more than a handful of these W types downunder , and are they used - or sitting in collections/museums? Re: Where are the oldies in Australia? Tazzieman wrote: I've never seen one in the flesh , but Tassy is a small state. This section of the forum is dead quiet so I was wondering , are there more than a handful of these W types downunder , and are they used - or sitting in collections/museums? There's two W189 300ds in Perth that I know of. Both are undergoing body-off restorations. There's also a W188 300S in Adelaide that appears at a few of the SA club's events. Pastelgrey can elaborate on this no doubt! They are definitely out there. There is one member of our club who owns 7! (4 x 300 limousines, a 300Sc, a 220 cabrio, 170SD and who knows what else). Our club president has a 170 which gets out fairly often. We've just had 3 brothers join the club who also have a 170. In the bay to birdwood 2 months ago there was a black 300 limo as well. CraigB had one, can't remember if he has sold it yet though. Didnt "Des" from Tassie have a W136 ? I forgot about these two that are in the WA club. Both 1951, the white W187 220 is in average condition, but the W136 170S is a peach. A 220 cab won the vic club concours lastyear and he regularly gets it out to shows including the Southbank display recently. Werner and his Adenauer. Won the show on sunday. Great story. 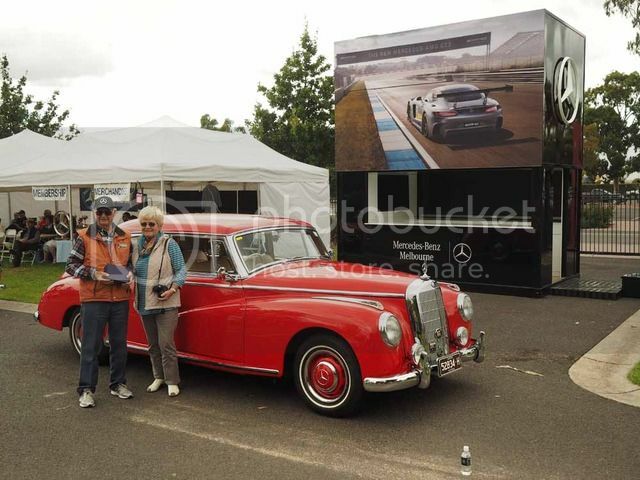 He was an apprentice at Mercedes in Hamburg in 1950! He had the car for a long time,stored for over 20 years and when he retired he restored it with his wife. He's in his 80's now...lovely gentleman and a deserved win...the car looked ace! What an amazing colour for an Addie too! I've only ever seen them in white/silver/black here in oz. I'm an oldie. Does that count? pastelgrey300D wrote: What an amazing colour for an Addie too! I've only ever seen them in white/silver/black here in oz. the car was originally black but when they visited the mercedes museum in stuttgart they saw a 300 in that colour and loved it! I was down for the wooden boat show last week and stopped to look at an öldie" on the Channel Highway Inbound between Tarooma and Sandy Bay.See attachment for example. It was in unrestored condition and certainly looks better than the one Ive attached. Best of luck. Was it a Tas rego? Our family's 1954 W186 300b and a 1952 W187 220 that used to belong to Murray Mules. Both still registered an in use for occasional outings. 1958 300d that I owned for awhile back in 2005. The 300b is also in the shot taken at the MBCACT Concours. 1953 170SD, that now has a 170S engine. Long term customer. Car is used as a Wedding hire car. Cream 300d belonging to MBCNSW member Ben de Boar and our 300b. My fathers old 170SD. Amazingly original car, still has the original leather interior. Then we have the really old ones. 1938 W143 Type 230 Cabriolet b. Restored mainly by my father with the mechanical sort out done at MB Spares. Here is one that we are currently restoring. Was originally black, then white and is now a dark navy blue. This 300b cabriolet belongs to a customer from the Gold Coast. Suspect that Ron might also know of this car. I'm very tempted to start a thread "I know of a car in Oz that John doesn't know or has a photo off"
Really enjoyed those pics - thanks for posting. The MBCV are in Tassy soon so hopefully will be able to catch up with the oldtimers in person...and their owners! Here is a 170S I owned for about 6 months, in 2010. Lance wrote: I'm an oldie. Does that count? Most of us here are OLDIES, so YES, it does count. If only I could remember what it counts for??? This LHD 300c cabriolet was for sale in Sydney for some time, I think it finally sold and went overseas. Given the recent price hikes in these style of cars, I would say the new owner did well. Last time I spoke to the seller he was going to take it to his house in Switzerland if it didn't sell. I have just come across and purchased a RHD Mercedes 170S. The owner tells me it is an original RHD. Any ideas on how many RHD 170S cars were built? Where can I look up the production numbers and engine details whether this vehicle is a matching number car etc. Please help...Thanks. The reference Southern Star The History of MB in Australia states around 200 cars/year comprising mostly 170 & 180 models between 1952-5. If you obtain the data card via your MB stealership you will have info re engine , chassis and gearbox numbers. I presume they can access factory records from that period. The card will also tell you if it was originally RHD. Data cards are available, but may not be very clear. If a right hand drive car, the chassis plate will begin 170s / and the body number will begin with an R. Top left field on the data plate. Unlike later cars, they do not have a 22 or 21 to indicate if right hand drive and auto/manual. Thanks for the information. Any idea who are the best guys for spares etc. Also will like to know how many 170S are left in Australia at this stage. It would be interesting to find out if possible. Will post pictures of my car once I get it hopefully by the end of next week. It depends on the sort of parts you are looking for, The forum sponsor (or his father) may have some, but otherwise Google is your friend - and it helps to know the name of the parts you are looking for in German. How many are left ? Your guess would be as good as anyone's. There are some driving around, but, like mine, there are a lot that are not registered, albeit that they are running and driving. They are certainly not common. Hi Thanks for the details. The car definitely has a R in the chassis plates. Its also a right hand drive and matching engine number car. One owner 50 years. it doesn't look as though you need any parts . Beautiful old car, well done. Tazzieman wrote: A very lucky boy! Thanks...Doing a bit of detailing on it at the moment. Will post more pics soon. Any idea about the central lubrication on the vehicle? What sort of oil do I need to use? Here she is again after doing some detailing and new tires. firmaoz wrote: Any idea about the central lubrication on the vehicle? What sort of oil do I need to use? I have never owned a 50s Benz so I don't know , but you could ask the previous owner. Speaking of whom , what do you know of this car's history? The previous owner was someone in WA who had it for over 50 years. Thats all I know and lots of money has been spent on the car. It is a matching number engine and chassis vehicle as well. Before putting oil in the CLS, it would be a good idea to clean all the lines and valves. You will probably find they are clogged up. The o-rings in the valves are difficult to find. The Classic Centre do not have them and they send the valves to Germany to be refurbished. The pump works on the upstroke as welll not downstroke as you would expect. I've seen the numbers on Finnie total production (1546 for my 300SE Lang), but is there a source for RHD production?